Rachel writes in her blog, “Time for Good Food,” about her trip to St. Simons and all the sites she saw and food she ate at The King and Prince. A week ago today I was at St. Simon’s Island, Georgia taking in the beautiful scenery and stuffing my belly with delicious food. Magical sounds cliché, but it really was an amazing trip that I won’t soon forget. I was invited by The King and Prince Resort and their publicist Leigh Cort, along with other journalists and bloggers from around the country, to be a part of a media trip focused on Southern culinary traditions. My friend Nikiwas also one of the journalists, so we rode down together.For someone like me who is enamored with history, food and the idea of eating locally and sustainably, it was sheer heaven. I learned so much, tasted so much and am so inspired, this is going to have to be several posts. Maybe a trilogy? You’ll see what I mean in a minute. I vaguely remember spending a day sightseeing on St. Simon’s Island as a child. One memory that stands out is visiting the moss draped Christ Church and its cemetery. I was excited to get to see it again all these years later. The parish was founded in 1736, though the current church building dates to 1884. A walk through Christ Church’s cemetery inspired prolific Georgia writer, Eugenia Price, to pen her first historical novel The Beloved Invader. The book brought to life the church’s rector Anson Dodge, Jr. and led to additional books, New Moon Rising and Lighthouse – known as the St. Simon’s Trilogy. Interestingly, Price stayed at The King and Prince in 1961 when she discovered the island that would define her career as a writer. Tourists still come to St. Simon’s today inspired by her books. Who knows, maybe I’ll be inspired to write a historical novel, but for now I’ll settle on a trilogy of blog posts. This first: an overview rich with photos. The exterior of The King and Prince’s historic hotel building. The King and Prince was built in 1935 and is the only oceanfront hotel on the island. I think that’s what sets St. Simon’s apart from other tourist destinations. It doesn’t feel touristy. You won’t find the high-rise condominiums and tacky beach stores. It’s quiet, laid back, upscale in some ways, but unassuming.Naturally, it’s a popular destination for weddings and romantic getaways. However, I’m totally inspired to take my family back there. A wedding photo shoot I happened to catch out the window. And there’s the Lighthouse. And the cute village with shops and restaurants. And the waterfront park. And the Maritime Museum that is housed in a former Coast Guard Station. I could go on and on, but I know you are probably wondering: what about the food? This is a food blog after all! Most of our meals were served at The King and Prince under the direction of its Food and Beverage Director, Vinny D’Agostino. While on staff for just a short while, D’Agostino is making great strides in bringing local farmers and food artisans “to the table” to enhance the dining program at the resort. Honestly, going in to this I was not expecting the food to be that great. I’ve had some pretty bland, uninspiring hotel food in the past — but I have to say that the food I tasted at the King and Prince was really delicious. The shrimp and grits, I swear, may have been the best I ever tasted. I’m going to attempt to make them at home and share the recipe with you in the next post in my trilogy! Shrimp and Grits made highlighted with Tasso ham, fresh corn and tomato. One afternoon we had the pleasure of meeting food growers and artisans from around the state and sampling their fare. The most exciting thing I tasted was the first pressing of olive oil made from Georgia-grown olives thanks to Georgia Olive Farms. It’s so new that it isn’t even on the market yet. 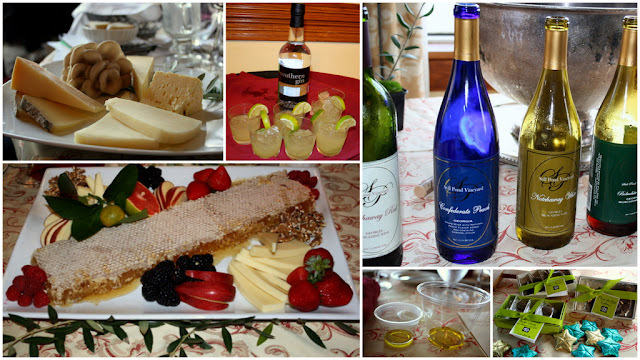 We also tasted cheese from Flat Creek Lodge, muscadine wine from Still Pond Vineyards, 13th Colony Distillery liquors, chocolates from Sugar Marsh Cottage, Wild Georgia Shrimp, Savannah Bee Company honey and peach products from Lane Southern Orchards — to name a few. I’ll definitely share more with you. Remember, my trilogy? Georgia made products we tasted. On our final day at the King and Prince, we ate breakfast in the elegant Delegal Room — once the ballroom of the old resort. I imagined how many dances, weddings, receptions and important events must have taken place in this stained glass adorned room with sweeping ocean views. I doctored this photo up a bit to look “old,” much like the actual historic photos that lined the lobby hallway and are featured in each guest room. It makes me feel happy. I love places with a sense of history, natural beauty and authentic Southern charm. You will definitely find that at The King and Prince and on St. Simon’s Island. Now, time for a short disclaimer: The King and Prince provided me with a complimentary stay and meals, but did not pay me to write this or endorse the resort in any way. By being a gracious host, showing me the island and sharing the spotlight with other local businesses and attractions, they made me fall in love. I’ll definitely be back! 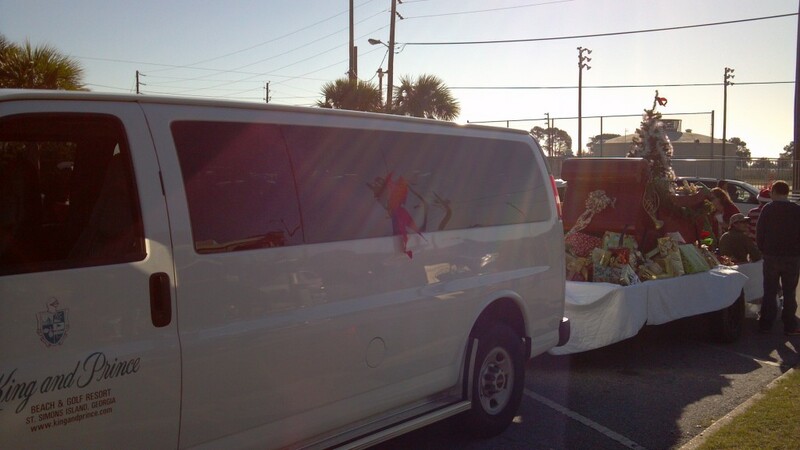 This past Saturday December 3, The King and Prince Resort was a participant in the annual Brunswick Christmas Parade. 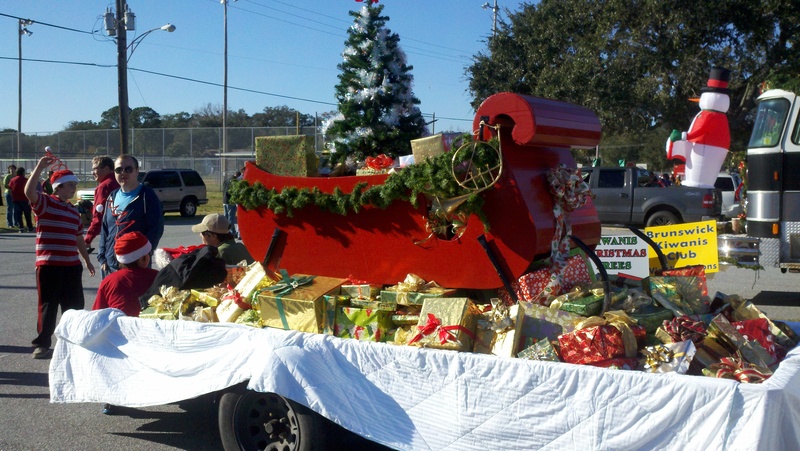 The parade featured floats from local businesses, clubs, school groups, religious organizations and more. There was over 100 parade floats this year. It was a great day to get in the Holiday spirit! The parade went from Howard Coffin Park up Gloucester St. and ended at Mary Ross Waterfront Park. Hundreds of families lined Gloucester to watch the parade. The parade concluded with Santa Claus. 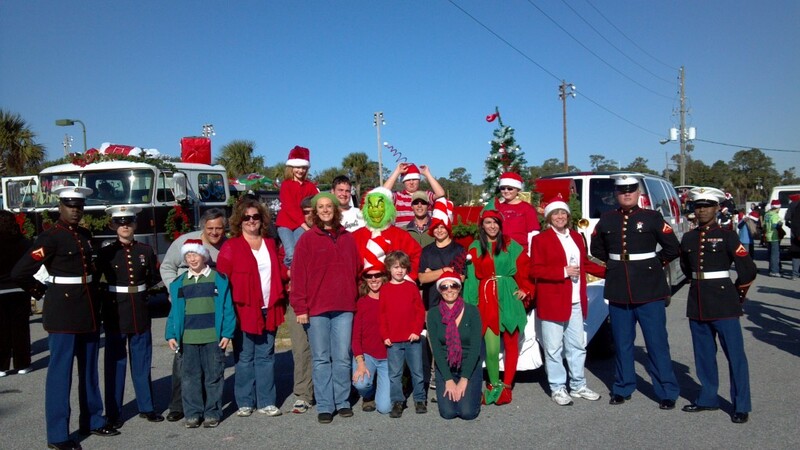 The King and Prince employees helped out to create the “How the Grinch Stole Christmas” float. The employees with their families passed out candy to the parade viewers and had a great time walking with the float. 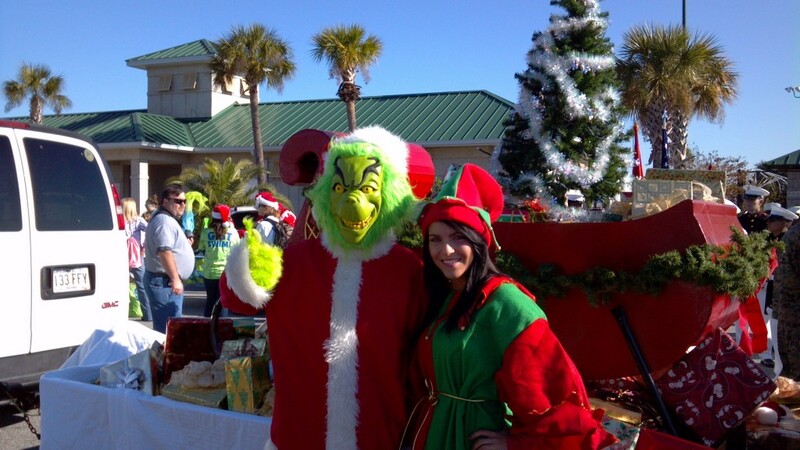 Our General Manager was the driver and we even had the Grinch with us!